A beautiful parrot, the moustached parakeet is named for its distinctive feathers above the beak that looks like a well-groomed mustache. This bird makes a great pet and has a sweet, outgoing personality that bird lovers enjoy. If you're looking for a small parrot that is prone to talking and perching on your shoulder, it's definitely a species to consider. The moustached parakeet has a very wide range in Southeast Asia. It is native to China and the islands of Indonesia, where a number of subspecies can be found. Feral populations are spreading to many other areas, including near cities. A decrease in natural habitat is also causing flocks to become urban dwellers. In the wild, this species tends to live in woodlands, hills, and mountains and gather in flocks of up to 60 birds. The group can become quite loud, so it's not hard to miss them. This is especially true when danger approaches as they have an unmistakable warning call. During mating season, a pair will leave the flock. They will find a tree cavity to call home until their chicks are mature. Moustached parakeets are medium-sized birds. They average 13 to 15 inches in length from the beak to the tips of the tail feathers. They do not have the characteristic long tail of many parrots. Instead, it is usually equal in length to the body. As with many other Asiatic parakeets, they have a somewhat slender build in relation to their length. Reports indicate that in captivity, moustached parakeets live an average of 25 years with proper care. Of course, individual birds may have slightly longer or shorter lifespans due to genetic and environmental variables. Moustached parakeets can make very sweet pets when hand-fed as babies and properly socialized. They are active, social creatures who love to spend time playing games with their owners. Some owners of moustached parakeets report that their birds tend to act bossy or needy. They will demand an owner's attention if they feel that they are being ignored. However, they do tend to be more relaxed than the boisterous Indian ringneck parakeet. Moustached parakeets do not tend to enjoy a lot of cuddling, though some petting near the neck is welcomed on occasion. This behavior can be changed over time if the bird is handled often and gently. Like other Asiatic species, they also go through a period of bluffing behavior during their adolescence. Because of this and their need for extra attention, they may not be the best "beginner" bird species, though some birders believe otherwise. Moustached parakeets display a rainbow of colors in their beautiful plumage. Their backs and wings vary with brilliant green and yellow hues and they have beautiful greenish-blue tail feathers. They have powder-blue heads with the characteristic "moustache" black stripes above and below their beaks. The rose-colored breast fades into a bluish-turquoise shade on the legs and bellies. This is a dimorphic species so it's relatively easy to tell males and females apart. While the males have a brighter pink breast, the easiest way to distinguish the sexes is by looking at the beak. The males will have a bright orange upper mandible with a yellow tip. Females have a beak that is shades of dark gray or even black. Both have gray skin on their feet. Some color mutations appear from time to time. You may see these birds with more blue or turquoise colors. As pets, moustached parakeets are not as common as some other species, though they are becoming more popular. They are often only available through specialty breeders. In addition to their beauty, these parakeets are very interactive pets who love to spend time with their favorite people. Known to be excellent talkers (especially the males), these birds will reward their owners with many years of comical companionship if properly cared for. While all parrots will make a certain amount of noise, moustached parakeets have been described as one of the quieter species in terms of screaming and squawking. Many owners report that the birds would much rather talk or whistle pleasantly than bellow the ear-piercing screams that hookbills are so famous for. For this reason, a moustached parakeet may be a good choice for those who want a parrot but would prefer a quieter bird. These birds are very curious and will always want to know what you're doing. They are explorers as well. If left unattended outside of their cage, they may end up in a part of your home you don't want them in. It's best to have a perch nearby and bring the bird back to it whenever he strays. They also enjoy perching on shoulders so they can be part of the action. While moustached parakeets are highly intelligent and very trainable, some owners report aggression issues. This is primarily in birds that haven't been properly socialized to all the members of their human families. Moustached parakeets seem to have a tendency to choose a favorite person and bond strongly with them while acting out toward other people and pets. If you are interested in keeping a family pet, the moustached parakeet may not be the best choice. However, if you are a single person or otherwise intend to be the bird's sole caretaker, then it could very well be the most loyal companion you'll ever have. As any potential bird owner should, do plenty of research on this species before deciding to bring one home. Contact local breeders and visit with their birds to get a feel for their personalities. This will give you a better idea of what it's like to live with a moustached parakeet. 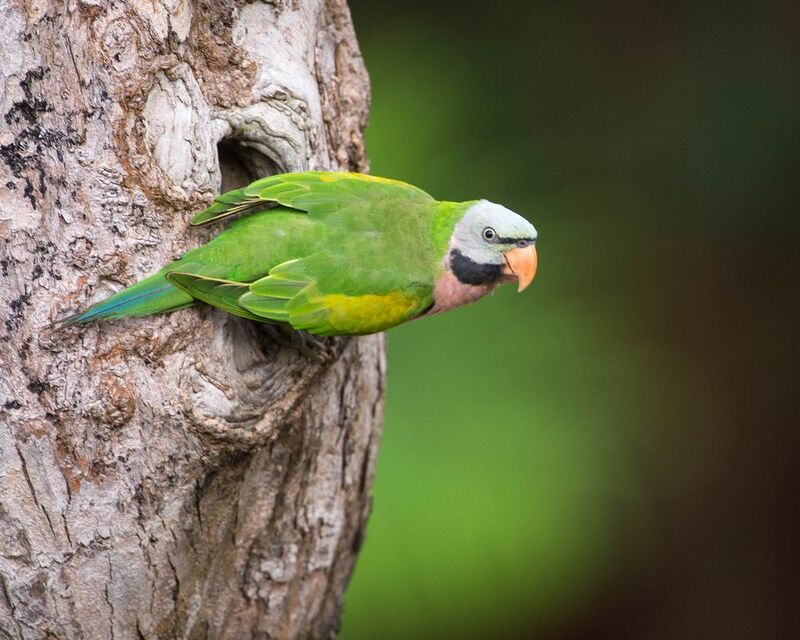 As with all parrots, it is important to feed pet moustached parakeets a varied diet that includes a high-quality commercial pellet formula and seed mixture, as well as a range of fresh foods. Moustached parakeets are known to be good eaters. They tend to be less finicky than other birds about the types of fruits and vegetables they are willing to try. Moustached parakeets are very active birds, both in the wild and in captivity. It is essential that their owners provide them with plenty of room to climb, swing, and play both in and out of their cages. It is recommended that moustached parakeets receive a minimum of four hours of supervised playtime outside of their cages per day, in a safe, "bird-proofed" area. Because of these requirements, they may not make the best pets for someone who has very little time to interact with their pets. Toys are essential to keeping this parakeet happy and out of trouble. Be sure to give your bird a large cage with plenty of ladders, swings, and things to chew on. Any toys made out of wood, leather, or beads will be greatly appreciated and provide needed stimulation.